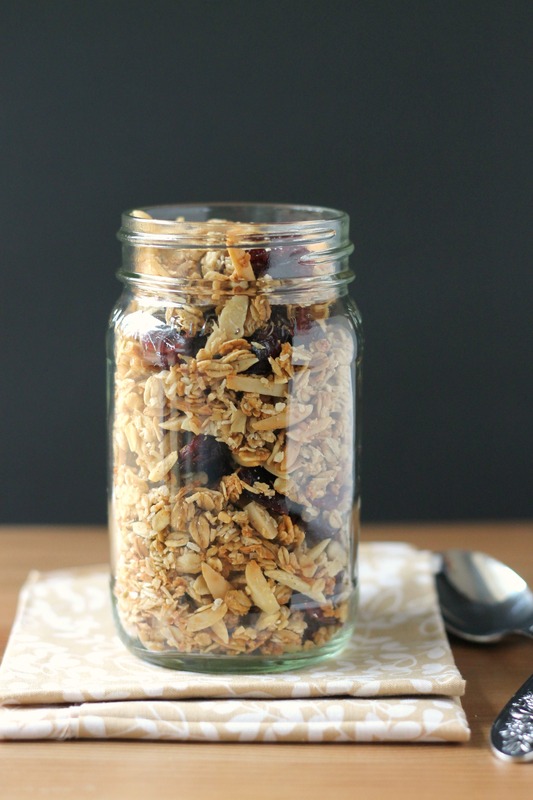 The Smitten Kitchen Cookbook has yet another winner in this granola! 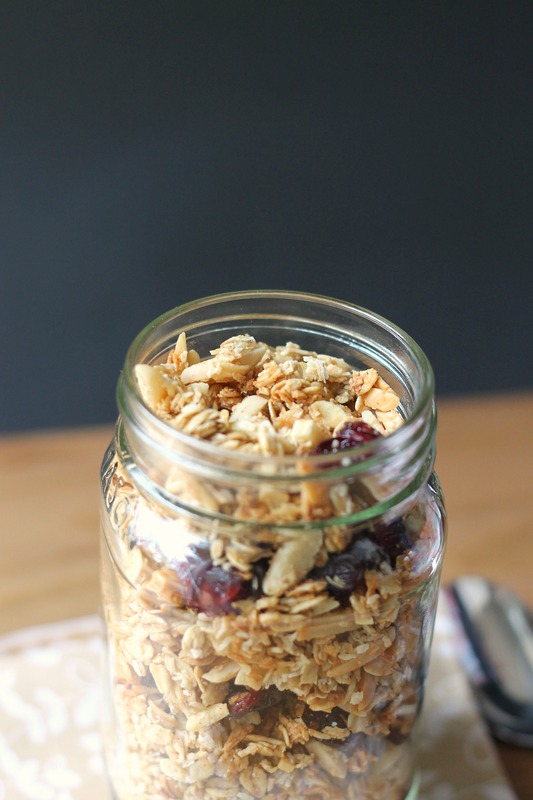 Most of the time we (or our mom) have made homemade granola, it tasted good but wasn’t super crunchy. This one definitely is. The secret to giving it its crunchiness is an egg white, something that sounds weird in granola but actually makes it crunchier. Another great thing about this recipe is the fact that it has maple syrup and olive oil instead of sugar and butter. Not that we’re adverse to sugar and butter (see: cookie dough cupcakes), but it’s a breakfast food and no one wants to eat 500 calories worth of granola! Plus, it has lots of coconut flavor. Dried unsweetened coconut is used, not the sugary kind, which also helps keep it in the breakfast food category. Make sure you are a coconut lover before making this recipe! You can definitely jazz this up any way you want. We went the dried cranberry and almond route, but dried apricots and almonds, dried pineapple/mango and macadamia nuts (a tropical theme with the coconut! ), or dried cherries and walnuts (the way the cookbook writes it) would all be equally yummy. We bet that during the Thanksgiving/Christmas season dried cranberries and pecans would be a festive choice. Preheat your oven to 300 degrees. Combine all ingredients but the egg white and dried fruit in a large bowl, stirring to coat evenly. Whisk the egg white in a small bowl until frothy. Stir it into the granola mixture to coat evenly. Spread it in a single layer on a parchment-lined baking sheet. Bake for 45 to 55 minutes. About halfway through the baking time, use a large spatula to turn over sections of the granola carefully, breaking them up as little as possible. Don’t worry if it breaks up a little; ours did and it was fine. Rotate the pan if necessary When it is evenly browned and crunchy, transfer the pan to a cooling rack. Cool completely. Once it is completely cool, break it into clusters. Ours didn’t really need to be broken up thanks to turning it halfway through. Add in the dried fruit. Keep it in an airtight container on the counter for up to two weeks, or put it in the freezer.